11-year-old Jake Chambers experiences visions involving a Man in Black who seeks to destroy a Tower and bring ruin to the Universe while a Gunslinger opposes him. However, Jake's mother, stepfather and psychiatrists dismiss these as dreams resulting from the trauma of his father's death the previous year. At his apartment home in New York City, a group of workers from an alleged psychiatric facility offer to rehabilitate Jake; recognizing them from his visions as monsters wearing human skin, he flees from the workers who give chase. Jake tracks down an abandoned house from one of his visions where he discovers a high-tech portal that leads to a post-apocalyptic world called Mid-World..
Man in Black: [repeated line to his victims] Stop breathing. 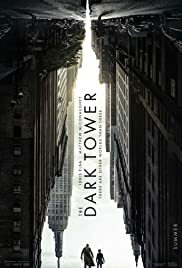 Q: Is The Dark Tower based on a book? Poor writing and directing. Missed opportunity. I have not read any of the novels, but I think I would be even more upset about the amateurism of this movie, and about the murdering of those (probably) awesome novels. First of all I would like to mention the aspects of the movie which were pretty good: -The scenery: The wastelands of Roland's world were beautiful. -The special effects/fight scenes: I was actually surprised how good the action scenes in this movie were. The special effect guys did a very good job. The fight scenes with Roland shooting bullets in slow-motion and Walter O'Dim's scenes were extremely fun to watch. -The actors: In my opinion the actors did a pretty good job. They did their best with the horrible script the writers handed to them. And now the negative aspects: -Awful writing: I have no idea how can four (!!!) writers create a stupid dialog and story like this. It's not even the book's fault, because as I know the story is completely different than the one of the books'. -The constant switching between the two worlds, the involvement of the "asian medium lady" and her village, the repetitive usage of the Warriors' praying were so unimportant that it makes me mad. Not to mention the ending...as if it was made for 6 years olds. 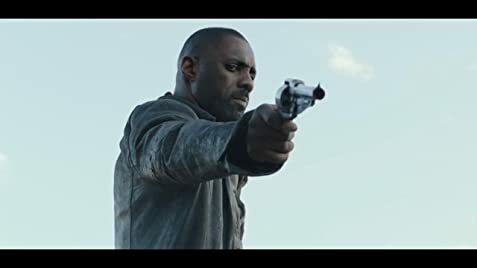 -Sloppy directing: The director was nominated for BAFTA Award, so I am pretty sure he just did not give a damn about making the movie at least mediocre with the absence of a proper script. The cuts in this movie (when there's no fight) are very annoying, and I am pretty sure I could have cut it to be more watchable than Nikolaj Arcel did (and I have not directed anything yet). Summary: The books had a perfect material to create an excellent movie series, but someone decided to create an upset, a ruined cinematography from it. I am pretty sure it is the fault of the negligence of the people behind this movie (writers;director). If a Sergio Leone directed this movie with the given universe, it would have become a classic. Now it's a movie nobody will remember after a couple of months (if yes, then it would be due to their hatred for the production crew). 89 of 187 people found this review helpful. Was this review helpful to you?